Nasal complaints are among the most common conditions for which patients seek medical care, including nasal congestion, runny nose, post nasal drip, and nose bleeds. At UOA, our physicians are highly skilled and use state of the art diagnostic techniques to arrive at personalized treatment plan to resolve your nasal complaints. If you have a concern as to whether or not this is the appropriate practice for your medical condition, please do not hesitate to call our office and ask to speak with one of our clinical staff members. 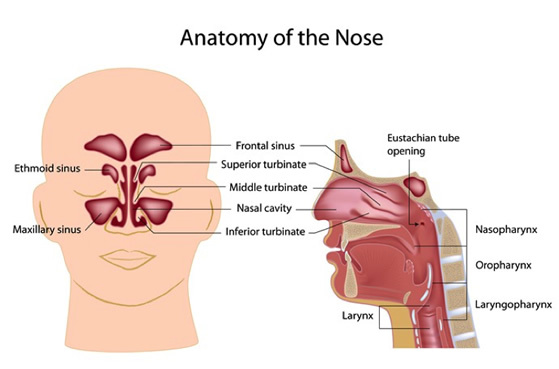 The nose is divided into two chambers by the nasal septum. The septum is made of bone and cartilage and covered by mucosa (the lining of the nose/sinuses and aerodigestive tract). Most people have some degree of “septal deviation,.” in that the septum is displaced to one side or the other. Occasionally it can be deviated to both sides in different locations. When there is a significant deviation, there can be blockage on one side of the nose and sometimes both. Septal deviations are typically acquired through trauma or through birth and development. Three pairs of turbinates (boney projections) are located on the side walls of the nasal cavity. These are covered with a mucous membrane and act to increase the surface area of the nose for warming, humidifying and filtering inhaled air. The nasal and sinus mucosal surfaces produce mucous that coats all of the internal nasal surfaces. The mucous helps to trap and clear and particles that enter the nose such as bacteria, dust or debris. It also provides moisture and humidity. The mucus passes to the back of the nose and eventually down into the throat where it is swallowed. This is a process that normally is not cited although if the mucus is thicker than normal or of greater quantity patients will notice this as postnasal drip. Rhinitis is an inflammation of the nasal mucosa. This can be caused by a variety of problems including allergy, viral infections (ex. the common cold), chemical irritation etc. The result is swelling and irritation of the nasal lining resulting in congestion, obstruction, mucus production, accumulation and drainage. Treatment is directed at the underlying cause of the inflammation whether allergic or non-allergic. Topical saline irrigations (neti-pot, saline spray) may be effective. Medications such as antihistamines, decongestants, inhaled nasal steroids also play a role. Sinusitis is inflammation and infection of the sinus cavities. This is often indicated by pain or pressure over the effected sinus associated with thick drainage that may be discolored (yellow or green). Sinusitis may be acute (less than 4 weeks) or chronic lasting for a month or longer. Chronic sinus infections may not be painful. They are often associated with malaise and fatigue. Sinusitis is caused by obstruction of the drainage pathways and accumulation of mucus within the sinus cavities. The sinus will again function normally if the mucus drains out and air moves in. Treatment is therefore directed at reestablishing drainage and aeration of the sinus. Most cases of sinusitis are managed medically, particularly for acute episodes. Supportive measures, such as, hydration, nasal saline, decongestants, analgesics and topical nasal steroid are most effective. Viral infections typically resolve within 10 days and do not require antibiotics which would treat a bacterial issue. Worsening of symptoms can be the result of a subsequent bacterial infection which may require treatment with an oral antibiotic to hasten recovery. For patients with persistent or recurrent sinus infections surgical intervention may be required to reduce the ongoing symptoms as well as the frequency and severity of acute infections. The surgery is designed to widen the sinus openings to allow proper drainage and ventilation. It also allows for enhanced delivery of topical medications for long term management of persistent symptoms. Often sinus surgery is combined with septal reconstruction in relieve nasal obstruction and provide for better access to the sinuses. The surgery is performed in an operating room using a variety of small endoscopes allowing for visualization of all of the intranasal structures and sinus cavities. Typically, the procedure is performed as an outpatient and requires no external incisions. It does not change the appearance of the nose but rather is designed to improve function. At University Otolaryngology we use state of the art technology to provide our patients with the highest possible level of care to achieve the best possible outcomes. This may include the use of a three dimensional computed guided navigational system called Fusion ENT by Medtronic. This improves the ability to access all of the recesses of the sinuses allowing for more complete surgery and ultimately a better surgical outcome. Patients with significant inflammation or polyp disease may be best treated with a steroid releasing stent Intersect Propel which is placed during surgery and left to release a topical steroid over the next several weeks. As with all of the treatment programs formulated by our experience professionals, the particular approach will be tailored to each patients specific needs. Cerebrospinal fluid (CSF) leaks occurs when the fluid that surrounds the brain leaks through a hole in the dura (the covering of the brain) and the bone of the skull. The fluid commonly drains from the nose depending on where the skull base defect is located. The leak can be the result of trauma, prior surgery or can at times occur spontaneously without any identifiable cause. Patients with CSF leaks typically complain of clear, watery drainage usually only from one side of the nose. The drainage can worsen with tilting the head forward and/or straining. Other symptoms can include headache, visual changes, and recurrent meningitis. If drainage can be collected it will be sent to the laboratory for testing to confirm it is CSF. Imaging studies such as CT scans or MRI may be ordered to evaluate the skull base. Treatment can be either medical or surgical. Conservative treatment is usually recommended first in cases of spontaneous CSF leak or after head trauma. Surgical treatment of CSF leaks is used when conservative measures fail. Surgery can usually be performed using an endoscopic approach through the nostril often in conjunction with a neurosurgeon. Sinus and nasal cavity tumors are most commonly benign (non-cancerous) and typically do not spread other parts of the body. Malignant (cancerous) tumors are rare. In the United States there are approximately 2,000 new cases of sinus tumors per year. Squamous cell carcinoma is the most common type of cancer found in the sinuses and nasal cavity. Other types of cancer include: adenocarcinoma, salivary gland cancers, lymphoma, melanoma and esthesioneuroblastoma (olfactory neuroblastoma). The diagnosis for a sinus tumor relies on a thorough history/physical examination, imaging studies and ultimately a biopsy of the mass. The biopsy is reviewed with a pathologist to determine the proper diagnosis. Treatment of sinus tumors is coordinated with a variety of other physicians including opthamologists, neurosurgeosn, medical and radiation oncologists when indicated. Treatment may include extensive sinus surgery with complex reconstructions, radiation and/or chemotherapy.